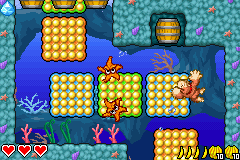 Risky Reef is a level in the Aqua World area of DK: King of Swing, and also one of the four levels that must be completed to unlock the world's boss level, Davy Bones' Locker. This is the first submerged level and consists of Lockjaws and Shuris who try to attack the Kong. Because of the level being submerged, Donkey Kong (or Diddy Kong in Diddy mode) moves more slowly than on land. Obstacles in this level include barrels, Barrel Cannons, tires, peg boards, and pegs that move in a large circle and sway with the water. As most levels, Risky Reef features a Crystal Coconut, located in a Bonus Level, and a bronze DK Coin. At the beginning of the level, there are two rows of four single pegs that sway slightly to the left and right. A trio of peg boards are above. A banana rests on each of the three boards. A fourth peg board is above them with two walls around it. Donkey Kong can reach the top of the walls and use them as platforms. Two separate rows of four pegs are on the pair of walls. The pegs sway a little bit with the water. Three stationary pegs are above, and a Lockjaw floats above them. Two peg boards are to the left and right of the foe, with one banana resting on each of them. Trios of pegs are above the two peg boards, and a third trio of pegs is between them higher up. It can help the Kong climb to a peg board with another banana on it. Two platforms stand on the sides of the board, and four pegs sway on the left platform. A Bonus Barrel is above a Lockjaw in the center of this area that can be reached with the pegs. When the ape gets in the Bonus Level it leads to, he must use many single pegs placed far apart from each other to cross a large gap, collect many Banana Bunches, and grab a Crystal Coconut at the end of the area. Once he finds his way out of the bonus, he can use the previously mentioned platform to the right of the area to access the second section of the level. A wall of barrels stand in Donkey Kong's way. In the second area of the level, there is a trail of peg boards leading through a passage between the coral reef. As Donkey Kong climbs, he comes up to a barrel in a small alcove that he can break to find a Banana Bunch. A pair of Shuris attack him in this area, and a trio of barrels are soon after them that block the Kong's path. The curvy trail of peg boards continues after the barrels, which more Shuris swim around. Another barrel sits in an alcove above a few of the boards. Shortly after, three more barrels block the ape's path, and the trail of peg boards goes on ahead, with a third barrel being seen in a small alcove. As before, Shuris attack Donkey Kong as he approaches a wall of three barrels that block his path. A few peg boards following the barrels have a ledge next to them that leads into the third and final part of the level. Here, there are peg boards of all sizes scattered around the area. Near the center of the area, a barrel can be found that makes a small peg board appear when destroyed. The board can help the ape reach another peg board at the end of the section, which has a barrel with a large Banana Bunch in it. A Barrel Cannon is right under it that shoots Donkey Kong back towards the cluster of peg boards. Lockjaws patrol the areas around the peg boards. Near the bottom of the area, the ape can locate a barrel that can broken to make a peg board appear next to a rock wall. If he breaks through it, he can find a large alcove with Barrel Cannons and Banana Bunches in it. The cannons can blast him through the alcove and then back towards the peg boards. Trios of pegs above some of the boards can help the Kong reach a group of pegs that move in a large circle. Tires are placed around them, as well as a barrel that can be broken to reveal a trail of single pegs that lead up to a hidden ledge with another barrel on it. When it is destroyed, a DK Coin can be found. 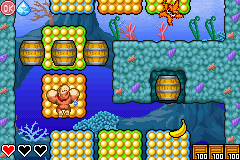 A Barrel Cannon is above the coin that can blast the hero through some bananas and back towards the circle of pegs. If Donkey Kong breaks the barrel to the right of these pegs, he can reveal some new pegs farther to the right that can help him reach a ledge with an exit sign on it. If he lands next to the sign, the level ends.